Google Indic Transliteration service helps us to convert Roman characters to the Devanagari characters used both in Hindi and Nepali. Though this Indic Transliteration is mainly based on Hindi devnagari, it's undoubtedly useful for converting into Nepali devanagari too since both hindi and nepali have the same syllabic script for writing. Therefore, it's useful for us(Nepali) too. The usefulness of this online Indic Transliteration is that you don't have to go through the hassles of installing Nepali unicode software. So, anyone without Nepali Unicode too can use this service and start writing in Nepali. You type words phonetically in English script and it would get correctly trasliterated. For example: typing 'Mero' would be मेरो. In addition to that,if the word is not what you desired, you'll be prompted to select most probable words you are trying to write. It's way too good. I tried other online unicode writer, but found this one quite useful. 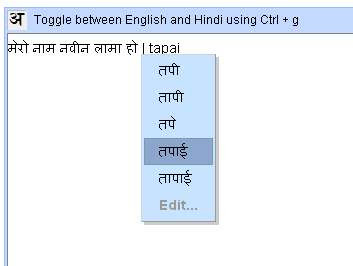 here is the link where you can type Nepali without any trouble. Well I am one of the fast typists in Unicode. But unfortunately if I have to searcher job in another company then I have to learn preeti again. But Unicode is so simple.